Back cover blurb: A hot beach. A young family on holiday. A fatal moment of inattention... And now Dave Jepsom is in their lives. Dave Jepsom, with his muscles, his pale eyes, his expressionless face. He saved their child. How can they ever repay him? Especially as what he seems to want in return is everything. He's in the streets they walk down. He's at the office where they work. He's at their front door, leaning on the bell... If only they could go back. Back to when the lies were still hidden. Before the holiday, before the beach, before the moment that changed everything. Before Dave. But it's never how it starts that matters. It's always how it ends. Marcus and Tessa are on holiday with their young son Josh, when the unthinkable happens. Tessa is changing her clothes, ready for the beach and Marcus is looking after Josh when his attention is diverted for seconds. Suddenly there’s screaming and Josh is being plucked from the sea by a stranger. In an instant Dave Jepsom is thrust into their lives. A large, muscular man with an intense stare, he makes Marcus feel woefully inadequate. This as well as guilt leads Marcus to invite Dave in when he turns up on their doorstep unexpectedly following the family’s return from their holiday. Tessa and Marcus are hosting a dinner party, and it is quickly apparently that Dave is very much out of place. But rather than being put off by their lifestyle, Dave seems intent of integrating himself into their lives, reminding them that they owe him for saving their sons life. Suddenly, he is seemingly everywhere. Everywhere that they don’t want him to be. 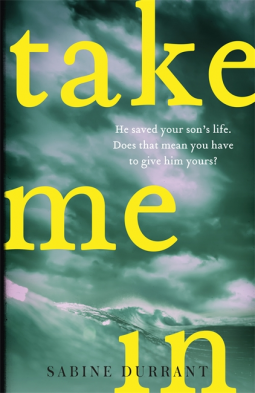 Take Me In is a twisty tale of secrets, lies, guilt, betrayal, and all those things we deal with on a daily basis but never really think about. None of us are living a guilt free life, we have all done things we would take back, but Take Me In plays with this theme to the extreme and is a gripping read. Take Me In is available from 28 June 2018.